Inclusions: Two nights accommodation in Port Moresby (one at the commencement and one at the conclusion of your trek), charter flight between Kokoda and Port Moresby, all track fees, licensing and accommodation costs. All meals on the track are included, as is the use of a company tent. Further inclusions include, entry to Brigade Hill and Isurava Memorial sites and other local historical site visits. This price also includes Bomana War Cemetery and city tours. Breathtaking views, stunning scenery, combined with a physical and emotionally enriched holiday, all at a competitive cost. The climb is worth it! Kokoda is renowned for the severity of the terrain, but it is so worth the effort. Some of the most spectacular scenery you will ever see; you will not be disappointed with the tranquil scenery and stunning backdrops that fill your day. Each trekker will receive complimentary use of one of our tents. Each tent had been specifically designed for the tropical environment with built in mosquito net and rain proof cover. For those that require, we hire back packs to carry all your essential items. These can be hired through the office for $80. Carrying your own pack or hiring a Personal Porter? Do you have a group of six or more? Give us a call for a special rate. Do you want to raise money for an organisation? We will happily assist you in facilitating this event. Our porters are residents of the Kokoda Trail. Most of our team walk the trail as their primary mode of transport between villages. We ensure that when you utilise our services for a personal porter that you will be matched with somebody that has your best interest at heart, wants to see you succeed and will go above and beyond to maintain your health and happiness. You can be assured that our porters are cared for and receive the fee that you paid for them, we do not make money off this service. It's a contract between you and the porter, facilitated by us. That's our guarantee! It's our recommendation that in order to best enjoy your experience that you hire a porter, that's for the friendships made in addition to the support you will provide to the local people and their community. An 8-night trek commencing at the village of Kokoda. Follow the Australian withdrawal back across the Owen Stanley Ranges south towards Port Moresby. Finish your adventure with a stunning sunset on night 7 and an amazing waterway on night 8 prior to one final climb to the finish line at Owers Corner. The first trek of the year is always a popular one, so hurry because space on this trek will sell out. This trek is led by Cam. Beginning at Kokoda, spend 9 wonderful nights on the historic Kokoda Trail climbing over the highest points making your way through the villages as you head south towards Port Moresby. This trek has an extra day of trekking and is a special for those worried about being able to make the distance and those that want to spend the additional time to explore the sites and all that Kokoda has to offer. Start your journey at Owers Corner and follow the original passage of the 39th Battalion. Walking toward Kokoda you will pass the toughest days in the middle of your trek and have time to reflect upon your journey as the trek eases in the final two days. This is a perfect time to trek and will see you achieve something that not many can say that they have. Based in the school holidays, this is the perfect time to bring the kids and thrust them into the history and the culture. This trek is led by Cam. Start your journey with a charter flight across the Owen Stanley Ranges and start your journey in Kokoda. Head south and swim in the stunning water holes. Spend the middle phases climbing some of the most scenic climbs prior to spending the second last night with a stunning sunset and the final night on the banks of the Goldie River in one of the best water holes you will ever swim in. 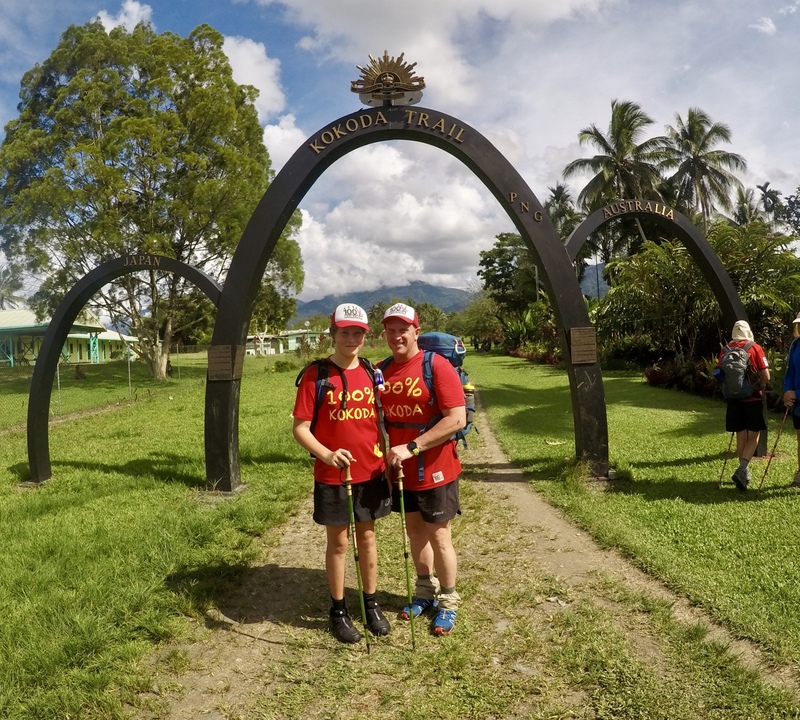 4 ASD Kids Trek: Walk the Kokoda Trail with dual international Mat Rogers and his good mate, Australian and New Zealand rock legend Jon Stevens as they cross the Kokoda Trail to raise money and awareness for families with children with ASD. This will be an amazing expereince and the chance to see Kokoda through the eyes of the soldier and raise money for a fantastic cause. This trek is led by 100% Kokoda Company Director, Cam and supported by both Mat and Jon. This trek is $6200 per person with international flights and personal porters included. An 8-night trek commencing at the village of Kokoda. Follow the Australian withdrawal back across the Owen Stanley Ranges south toward Port Moresby. October is always a good time to trek as there is plenty to see and do out there. This trek will be led by Cam and will be his final trek of the year. Take this opportunity to walk with him and see his passion for the war, the history, the men, the porters and the legacy that they all left for us. This trek will be led by Cam and be his final one for the year. Beginning at Owers Corner, walk north toward the village of Kokoda following the original pilgrimage of the Australian Soldiers as they walked to secure the village of Kokoda. This is our final trek of the year and is one not to miss. The boys will be excited and set for their end of year break so they will be in full song and even more full of enthusiasm. Give yourself some amazing stories to tell the family at Christmas and spend your November on the track. Beginning at Owers Corner, we walk north towards Kokoda over an 8-night journey enjoying the stunning swimming holes and tackle the more severe climbs earlier in this trek. See the post monsoon water as it thunders down the rivers. The first trek of the year is always a good one, you get a little bit of everything and you know that you are one of the first to cross the track that year, it looks untouched! 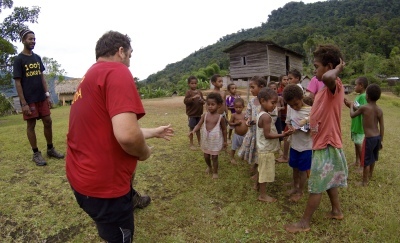 An 8-night trek commencing at the village of Kokoda. Follow the Australian withdrawal back across the Owen Stanley Ranges south toward Port Moresby. This trek is always close to school holidays so this is a good one to bring the kids on to help educate them about Australia's history. Let them see the sites themselves and be thrust into the culture. Commence your adventure at the southern, Port Moresby end of the trail. Start with a visit to the Bomana War Cemetery to set the scene and make your way across the trail, letting the story build to a massive creshendo on morning 8 at the Isurava Memoril with a Dawn Service to commemorate the fallen. August is a great time to take that winter getaway and take advantage of the cooler PNG weather. Beginning at Owers Corner, we wa​​​​lk north towards Kokoda over a 9-night journey. You'll spend ANZAC Day at the site of the Battle of Isurava and watch the sun rise over the monument, sharing this once in a lifetime experience with your fellow Australians. Watch in awe what is quite possibly the most humbling Dawn Service that you will ever experience. This trek will be led by Cam and will sell fast, so call today to book your place. People are already booking on this one. The second of our ANZAC Treks will head north and follow the original pilgrimmage. You will spend the eve of ANZAC at the site of one of Australia's bloodiest battles, Brigade Hill and you will conduct a dawn service in this location. This will be one of the most special treks that we will have ever led. This is the sort of trek that you will remember every ANZAC from this point on as none will live up to this again, no matter what you do. Contact us today for more info on this one. (The guides are fighting over this one). Commencing your adventure with a flight over the Trail to the village of Kokoda. See the stunning scenery prior to spending 8 days walking in it. Septemeber is always an amazing time to walk, there is usually a few other groups around to feed your morale, but its never too busy. This one is popular with those that have kids as it falls near the holidays. Let them see how kids in another culture live and learn. The third of our ANZAC Treks will depart the village of Kokoda and head south towards Owers Corner. You will spend ANZAC at the Isurava Memorial with Cam's 100% Kokoda Trek that is heading north. Conducting the Dawn Service this early in the trek will set the scene for the remainder of the trek. Take advantage of the opportunity to trek Kokoda over ANZAC and see it through the eyes of a soldier. Spending 8 nights on the trail heading north towards Kokoda. You will build into the history and be amazed how the soldiers managed to cross "the bloody track" with what they had. Be inspired by the story and fall in love with the locals and the scenery of where they live and work. October has never let us down. The footy season is over and cricket is yet to start... you will not miss anything being off the grid in October..
An 8-night trek commencing at the village of Kokoda. Follow the Australian withdrawal back across the Owen Stanley Ranges south toward Port Moresby. On the final day of this trek, Kokoda will throw one last challenge to you to remind you of what you have been through. This trek concludes with a visit to Bomana War Cemetery to tie it all together. May is always a popular month to trek as the weather is a little cooler and ther track a little drier. Book your place today. This is our final trek of the year and is always one not to miss. The Porters will be excited for their end of year break so they will be in full song and even more full of enthusiasm than usual. You will follow the orginal pilgrimmage and walk towards Kokoda. Give yourself an early XMAS present and walk Kokoda with us, the juice is worth the squeeze. Beginning in Port Moresby, start your journey with a visit to the Bomana War Cemetery prior to commencing North towards the village of Kokoda. This is always a popular trek for so many reasons, the main one being that all of the fruit and veggies are coming into season and it is to die for. Finish your adventure with a flight back over the trail to see what you have accomplished. Do these dates not work for you? Want help preparing for Kokoda? 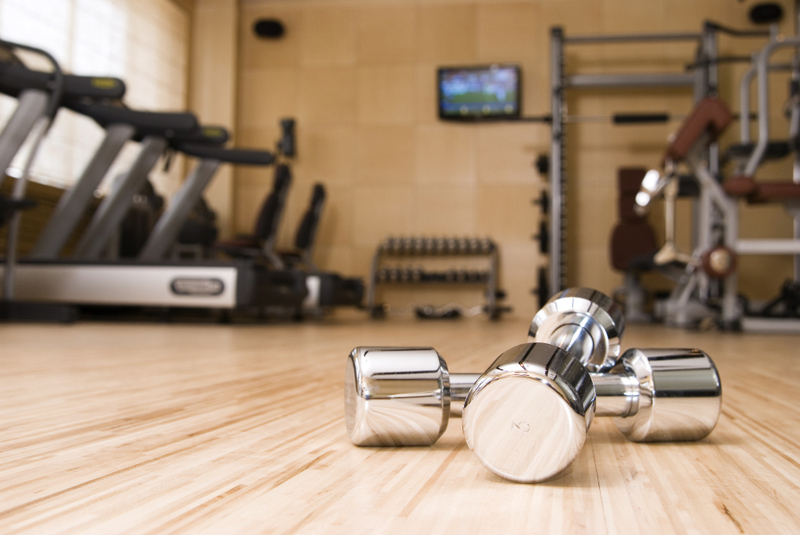 Our training program is designed specifically for your challenge. Don't know how to train for Kokoda? Let us take that worry off your hands. Your training program will not only get you to the start line, it sets you up to finish with a smile. Your program has specifically been designed by Cam to set you up for success. Cam acknowledges that most undertaking this life changing event have to prepare around work, family, and everything else that life throws at you. Your program is not designed to walk long distances every day, rather it's designed to prepare you for the joint stability, strength and endurance requirements that walking Kokoda demands. More to the point, Cam is available to talk to you about your training and to help​ you prepare for your journey. Being a quaified Personal Trainer who specialises in strength and conditioning in addition to proprioception, Cam understands what you need to do in order to best prepare. Your program comes with daily and weekly requirements and you are able to call, email or facetime Cam to ask questions about your preparation. You will receive emails with hints on training as well as video's to help you get the best out of your training. As a female trekking on my own, finding someone that took my safety seriously was paramount. To discover that I was the only female in my group it then also became important to me that I was treated no differently to any of my male counterparts. In both regards, Cam reassured me completely and I barely had to think about either. I felt comfortable, safe and relaxed the entire time. As a leader, Cam went to the enth degree to ensure we not only enjoyed the physical hiking experience, but were provided the full measure of Kokoda's history. He had an obvious personal interest in the war; his recall of event details was phenonimal and made for an authentic and humbling insight into the war and its affects. Cam gave 100% of himself during the trek, spending time with each member of the group throughout each day and made the evenings fun and interactive. I had the experience of a lifetime, I achieved a life goal, met amazing people and learnt more than I ever imagined. I highly recommend trekking with Cam. Trekking the rugged wilderness of the Kokoda Trail was a positive life changing experience. Having been fortunate to have previously completed other internationally renowned treks I had high expectations when signing up to trek Kokoda. I was not disappointed - my expectations were not only met but also exceeded, returning home richer for the knowledge, memories and friendships founded on the trek. I cannot speak highly enough of our Trek Leader Cam who passionately shared his phenominal knowledge of Kokoda's history, enhanced by his own military experience. Cam's passion and enthusiasm was contagious, and despite the physical exhaustion at the end of each day we all retired to our tents looking forward to the next day's adventure. Cam ensured the health and saftey of each and every one of us was of paramount importance and it was easy to find comfort in his professionalism and natural leadership, as was further reflected by the obvious mutual respect Cam had with the porters and local communities. If “KOKODA” is what you want to experience than 100 % Kokoda is the ultimate choice. Not really knowing what to expect, but knowing what I wanted to experience was the key, when I was planning my trip to PNG. The direct communication with Cam James at 100% Kokoda cemented my choice of which company was right for me; especially after our phone conversations he gave me a real feel of the personality that was going to be guiding my journey. Every time I had a query Cam came back to me efficiently and well informed. That was the at beginning and he well and truly delivered above and beyond what I was expecting. The whole trekking encounter was really-well planned and delivered in a way that presented a very personal and emotional journey. With 100% Kokoda, the team environment helped drive every person to push their own limits as well as supporting each other when the going was hard, but when there was something to sit back and admire or a scene to be set or an emotion to be felt, Cam was always prepared to bring everyone together to create that atmosphere for the supreme experience. Due to Cam’s army experience the war and military aspects of Kokoda are all extremely well covered, with no stone left unturned, there was well delivered facts about individual acts which not only changed the course of the specific battles, but as well as undoubtedly the course of our nation. Everyone has the question about food, but you don’t have to be concerned, as it was all healthy and very appetising and provided sufficient energy for the day’s adventures and there was plenty to go around. On our trek, we had delicious curries, pizzas and even freshly baked cakes on more than one occasion. Cam is physically, mentally and emotionally committed to his pursuits in PNG. I was a bit taken back by the lack of prosperity when I arrived in PNG. It’s very rare to see an Employer care about his employee’s that much to actually want to make a difference not only to improve their lives but also the lives of their families, as we seen firsthand all along the trek, particularly on our culture night when we were welcomed warmly into our head porter’s village for that local experience. When working out what to pack and take with you, having already been, I have this to say. If Cam says to take it you will most likely need it and if he says not to take it you’re probably going to carry it all that way and not even use it. I used everything I took, baring thankfully most of the medical supplies which I was happy about as there’s no ducking off to the shop if you do need it. I chose to give all of this to my porter at the end of the trek for good use in his village. When I was originally planning a trip to PNG to walk the Kokoda trail to follow in the footsteps of our brave soldiers from the past, I had over a dozen names of willing participants wanting to come; I ended up with myself and 1 other. Even though the trek was challenging, the toughest decision for many was actually, making the serious commitment to go. Don’t wait for someone else to commit who “Wants” to go or is “Thinking” about it. Make the decision to commit for yourself, it will be one of, if not the best decisions you will ever make. I was a member of a very small group, with Cam as our tour guide. Over the 9 days that he was with us he was a god-send - patient when the self doubt crept in, encouraging when the track got tough and full of information about the key historical sites along the way. I am quite sure that we tested his resolve on numerous occassions, but he clearly has the patience of a saint. Cam managed to give heroes and stories of the Kokoda campaign their due regards as well as directly relating it back to more recent military campaigns and his own personal experiences. His story telling abilities reduced me to tears on more than one occassion. This was truely a once in a lifetime experience and I will be forever grateful for Cam's encouragement. His support was, in no small way, instrumental in making sure that everyone in our group were safe, remained healthy and that we all reached our goal. I cannot thank-you enough Cam. How can someone you only spent 9 days with have such a profound impact on your life? It's the one thing I never really thought of in all of my planning to walk Kokoda was the guide that you experience it with and their ability to make the trek come alive, convey the story and get you safely to the other end. If you are reading testimonials you have pretty much made a decision that will change your life - book it NOW! It is amazing. I researched at length training tips, what to pack, how to look after my feet, what boots to buy, history of the conflict etc etc but I neglected to really put any thought to who I was walking with or who I was guided by. Cam comes with a two for one deal, an experienced Kokoda Trek leader and a high ranking serving soldier. To be walking through the Kokoda Track and seeing it also through the eyes of a soldier only adds extra layers to your experience that I never budgetted for. Book it now, I wish I was going with you. You will be forever touched by the experience. I had the privledge of walking the Kokoda Track with an amazing group of people, led by a remarkable person by the name of Major Cam James. Although ardous and often heartbreaking, this life changing experience is one of the most memorable experiences of my life, largely due to the efforts of Cam. He made the trek enjoyable and informative through his ability to communicate across the entire group both individually and as a whole. His knowledge on the history of the conflict and the principles of war were invaluable and provided another perspective of the battles that occurred on the track. His commitment to providing as much information and the enormous respect he holds for the locals was also commendable. I would not hesitate in recommending trekking and experiencing Kokoda with Cam to anybody interested in completing this amazing challenge. It will change your life! For me trekking the Kokoda Trail was the most awe inspiring, uplifting and emotional journey I have ever endured. During your trek you will find the experience will stir emotions that you never thought possible. In fact, for most of us, this experience is life changing. Cam was the reason why I travelled back to PNG for a second time. He made such a great impression on me with his knowledge and passion for keeping this important history alive. I knew that I would be travelling back to PNG to re-do the trail before I had even left. Cam has a natural ability to bring out the best in people, he takes time to talk to each person to find out their background, circumstances and why they chose to trek Kokoda. Within a matter of hours upon meeting, everyone in the group was relaxed with one another and all having a laugh together. What Cam does with his social media is great. It was amazing to get to meet the other trekkers through his facebook page and learn a little about one another prior to travelling to PNG, this made me feel at ease. The thing that I believe makes 100% Kokoda stand out from the rest is that Cam in an actual Soldier. Cam has a way of getting everyone into the mind set of a soldier, and he is able to explain things like you are in the midst of the battle and actually there as it happened. He explains in great detail withouth using military jargon which was important for someone like me as I do not have a military background. What he says and how he says it is very easy to understand and makes complete sense. Cam has had recent military experience in such places as Afghanistan and he has the ability to bring the battles to life, for example explaining what might happen if you walked into an ambush, how it all works and how you are going to be feeling, he puts you into thier shoes. You can find yourself on a blind corner on the track, lined up one behind the other and Cam will stop you and explain in the same position what the first soldier will be doing, what he is looking for, what he is thinking and what he is feeling. He will then do this for the remainder of the people and make you see it from their perspective. His attention to detail is incredible and you find yourself staring at the jungle, walking stick in your hand as your rifle moving slowly around the bend waiting to be ambushed. Whilst trekking the battlefields, if like me, take the time to stand and think away from the remainder of the group, even for just a moment. Its very easy to imagine what occured at that very place. You are able to see the battles occurring around you, all because of how Cam explained it. Although a very peaceful track now, I found that I could feel things that had happened out there. Its kind of an eery place, but also a very special place with beautiful rugged terrain with the most magnificent views from the villages that are dotted throughout the trail. Once you have completed the Kokoda Trail you will come away with a massive understanding of the history of the campaign, of what happened at every location and a have a deep admiration and connection with all that fought there. I am already planning a third trip with more friends who are all itching to experience the Kokoda Trail, Maybe I'll see you out on the Track. Not really knowing what to expect, but knowing what I wanted to experience was the key, when I was planning my trip to PNG. The direct communication with Cam James at 100% Kokoda cemented my choice of which company was right for me; especially after our phone conversations he gave me a real feel of the personality that was going to be guiding my journey. Every time I had a query Cam came back to me efficiently and well informed. That was the at beginning and he well and truly delivered above and beyond what I was expecting. So what makes us different from the competition? 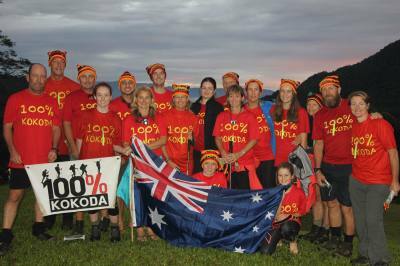 There are quite a few companies that lead treks across Kokoda. At 100% Kokoda we guarantee that you will not be disappointed. Some companies make you carry your own food, others keep a "porter fee". At 100% Kokoda, we carry your food for you and prepare all meals from scratch. We use the best porters and pay them what you paid for them, we do not keep a fee. If you seek military history, you will receive a fully comprehensive educational tour. If you seek less military history, thats ok! You are well catered for and can enjoy the tranquil scenery, all whilst you enjoy the relaxation of being away from work and all forms of outside communication. Want to escape from the rat race? Give us a call today. Do something different for a change. The latest holiday package that pays homage to our history and allows you to achieve a physical feat in a stunning setting.